The Midwest Chapter of the Society of Cosmetic Chemists (SCC) will host TeamWorks 2018 on April 11, 2018, at the Donald E. Stephens Convention Center in Rosemont, IL. 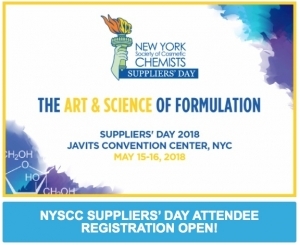 Chemists, chemical buyers, engineers and technologists in the cosmetic, personal care, home care, pharmaceutical and other allied industries will mingle among over 100 booths representing prime technology suppliers in the industry. The connected social night on April 10 will be held at the Hofbrauhaus Chicago, the first and only German micro-brewery and beer hall to call Chicago home—think Oom-Pah band, special keg-tapping procession and a Masskrugstemmen (a Bavarian beer stein-holding contest)! Ticket price includes open bar from 6-9pm followed by a one-hour cash bar with a free signature drink.